I teach writing to upper elementary grade students part-time and when I’m not working with kids, I teach writing in an online degree program. Although there are plenty of drawbacks to digital learning environments, the discussion forum in an online class–if thoughtfully moderated–is not among them. On the contrary, discussion forums help keep my college students on-topic, hold them accountable to their claims and, because the forum posts are in writing, the platform can deepen analysis and reflection. With this in mind, I added a written component to the traditional face-to-face discussions I facilitate in my elementary level writing classes, and as my classroom collection of Chromebooks grew over recent years, I began exploring ways to adapt the discussion forum to my younger learners. I experimented with a few of the free online tools available like TodaysMeet and Formative, but the tech tool I’ve come to rely on most is the humble Google doc table feature. So quick, versatile and free! In my previous In the Classroom post, A Concrete Approach to Teaching Revision: “Sensory Mapping” with Google Docs, I discuss using Google tables to help scaffold the revision process. 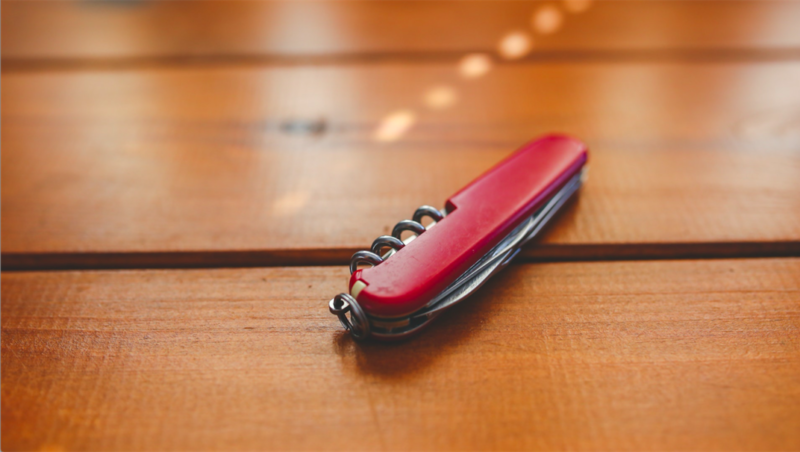 Here, I’ll highlight a couple of ways I use this tool to replicate a discussion forum. 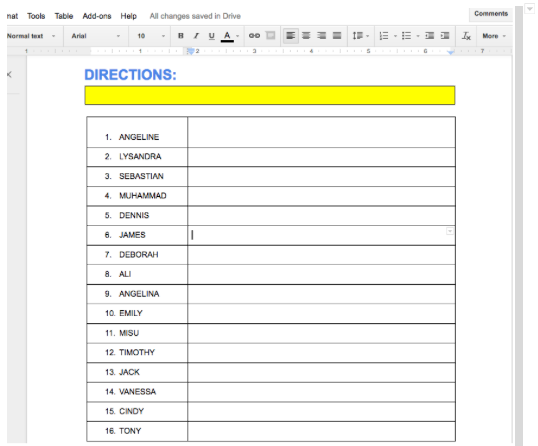 I create a Google doc template using a table to create a box for each student to write in and make (digital) copies as needed (File>Make a copy). I number the boxes so I can easily individualize instruction by assigning specific prompts or questions to specific students, i.e., “If your name is in box 1-5, do prompt 1…” I share a link to the doc with students then project the table on to a screen to highlight and point out prompts or passages quickly to the entire class. Here’s a template where each student’s name appears in a separate box. The only drawback to a template like this is that there is nothing preventing students from typing in someone else’s box (or deleting the entire table!) either on purpose or accidentally. One work-around is to change share setting to “comment only.” If you go this route, you’ll need to paste a class list onto the bottom of a Google doc in the second column of a two-column table with the borders set to 0. It’s important to set the border to 0 so students can’t see the empty boxes, which can be distracting. In this template, names appear in a table column (here, borders are set to 0 point width so the table doesn’t actually show up). Students use the comments tool to post responses in the margin. Workshopping student drafts–presenting works in progress for peer critique–is a key component of writing workshop, but it is also the most easily derailed. When I first started teaching, workshopping student writing meant an oral class discussion, often dominated by a handful of students. The discussion would flounder in generalities (“I like your story”) or drown more nuanced, big-picture issues in a sea of comments about minor editing concerns. It soon became clear that some structure would be essential to keeping the workshopping process dynamic and substantive. After some tinkering, I discovered that Google tables do the trick. I just copy and paste a passage from a student draft into a shared Google doc, along with prompts to bring focus to the peer-critiquing process. In the example below, students discuss how to bring precision to a chase scene in a sci-fi story by two fourth graders. 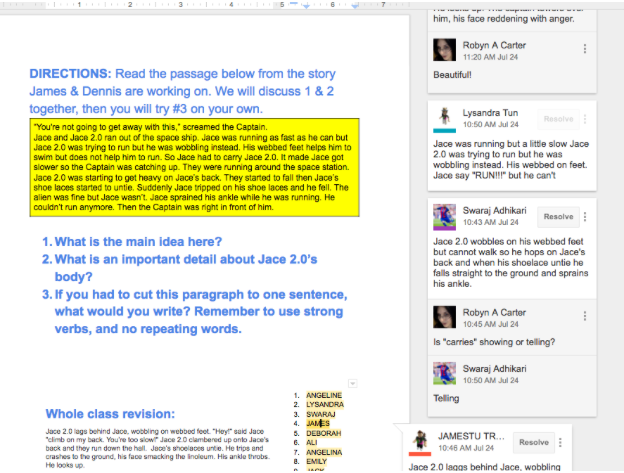 Each student makes a suggested revision in a comment box then responds to a classmate’s suggestion. The “whole class revision” at the bottom resulted from an oral discussion of the passage, highlighting several suggestions posted in comments boxes. As students refined the sentences orally, I typed the lines they dictated. 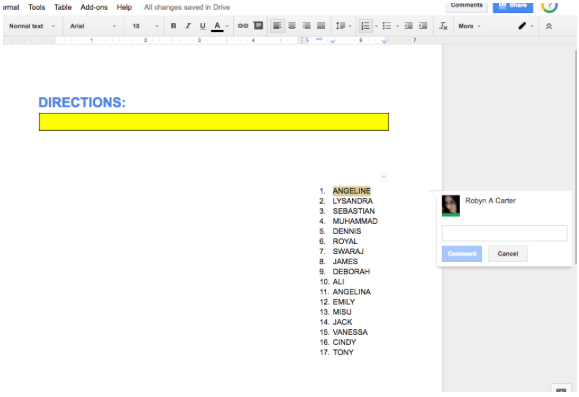 Here’s a screenshot of a shared Google doc my class used to workshop a passage from a student draft in progress. Each student’s name appears in the right hand column of a table (with borders set to 0 point width). Students post responses in comments boxes. Click the image to access the actual document. I devote a lot of time in my writing workshops to close looks at mentor author techniques and strategies. Several times during the course of a whole-class novel study, my students do a mentor text exercise: I paste passages that illustrate how a mentor author handles a specific writing challenge onto a shared Google doc and ask students to analyze how the strategy is working. Then, they try it out in their own works in progress. I list student names in a table, and they use the comments feature to post their impressions and experiments with the strategy under consideration. Typically, while students work on a mentor text exercise, they have the shared Google doc open in one tab, and their own draft open in another. They paste a sentence or passage they want to revise as part of the exercise into a comment box in the shared doc. Click the images below to see examples. 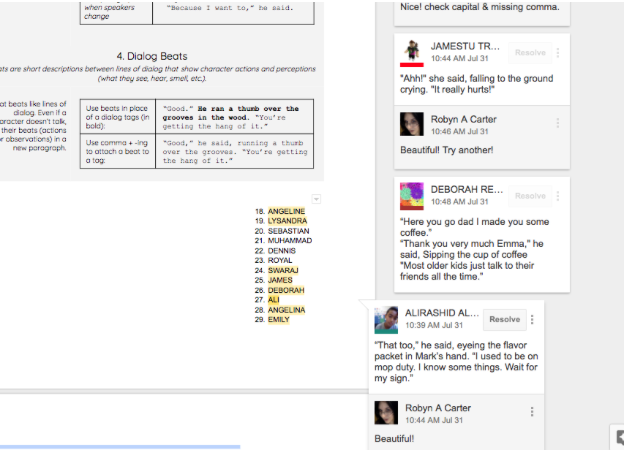 Here’s a screenshot of a shared Google doc my class used for a mentor text exercise on writing dialog tags and beats. Each student’s name appears in the right hand column of a table (with borders set to 0 point width). Students post responses in comments boxes. Click the image to access the actual document. The shared Google doc enables me to give real-time feedback to each student using the comments feature without having to click between different documents, or worse, rifle through a stack of papers after the discussion is over. Another advantage is that I can edit as I teach. If students misunderstand the wording in directions or prompts, I can immediately clarify, and students will see my clarification in writing as I type it. The single table on the same shared document means students can see each other’s responses, see my feedback, and comment on one another’s posts. A blank cell or missing comment box lets me know which students haven’t responded yet. Nobody falls through the cracks the way quieter kids sometimes can during oral discussions. And the public nature of the table motivates kids to get thinking and writing. Nobody wants their box to be empty. The Formative platform does something similar but does not offer any way to differentiate instruction; it requires every student to respond to the same prompt. Another drawback to Formative is that it doesn’t offer way for a teacher to see at a glance which students have responded and which have not. Google docs and tables, on the other hand, are as customizable as you’d like; different students can discuss different elements or perspectives on a single theme, problem or topic. Another plus: the documents automatically save to each students “shared with me” file on Google Drive. This means at any point in the revision process they can easily find peer and instructor feedback on a draft they workshopped with the class. And perhaps most importantly, students can respond to my comments as well as each other’s; learning is not a one-way, teacher-paved street, but more of a web. I love the idea of peer review within the google universe, so that not only changes are tracked, but also student comments! I would also add to the whole discussion a positive “calling out” of the particularly meaningful comments, and explain why those were so helpful, to model good peer feedback techniques. Thanks so much for sharing!